Origin Southern and eastern Europe and Asia. Hyssop, (Hyssopus officinalis), commonly called Common hyssop, garden hyssop, Curdukotu, hastipippili, hisopo, yanagi-hakka, Yssop, Hyssop Herb, Isopo, Ysopo is a garden herb of the Lamiaceae or mint family whose flowers and evergreen leaves are used as a flavoring for foods and beverages and as a folk medicine. Mint family consists of a wide variety of medicinal and kitchen herbs. Other popular plants in this family are peppermint, basil, sage, lavender, thyme, oregano, rosemary and catnip. It is native to the northern Mediterranean coast and Asia Minor, but has naturalized along roads in some parts of the U.S. Many believe that the name Hyssop has been derived from the Hebrew word “Aesob” which means holy herb, and also from the Greek word “Hysoppus”. It is said that centuries ago the herb was used in cleaning and purifying sacred places. Leaves have been and still are used in cooking to flavor such things as meats, soups, sauces, salads or stews. Hyssop oil is currently used as a flavoring agent in Chartreuse liquor. Plants are attractive to bees and butterflies. There are four varietals of the species, each are distinguishable by their flower’s color or size. H. alba has white flowers, H. rubia has red flowers, H. rosea has pink flowers and H. grandiflora has larger bluish-purple flowers.6 A study found that of these four phenotypes, the blueish-purple variety has the strongest odor of the species. Hyssopus officinalis, commonly called hyssop, is an aromatic, semi-evergreen, woody-based, shrubby perennial, herbaceous shrub that grows in an erect bushy clump to 2 -3 feet tall and has a spread of about 1 foot. It is frequently grown in herb gardens and as an ornamental. The ideal soil should be loose, well-drained, dry and located in full sun, plenty sandy component and with good ventilation. Avoid excess moisture and heavy and clayey soils, as well as those that allow water stagnation. The plant grows in rocky, dry, and stony locations and in the cracks of old walls. It is a hardy species and can withstand desiccation. Beekeepers use the plant to attract bees and produce a pleasantly scented honey. Stem of the plant is 20-50(-80) cm, much branched, striate, pubescent, quadrangular. Leaves are sessile, linear to lanceolate, 2 to 2.5 cm (0.79 to 0.98 in) long, glabrous, glandular, scabrous and finely strigose along margin, base attenuate to cuneate, margin slightly involute, and apex obtuse. Flowers in whorls six- to fifteen-flower with a tubular corolla, two-lipped, blue or violet in color, with bell-shaped calyxes. Depending on the species, the flowers range in color from white to purple, pink, blue, or bluish-purple. Flowering normally takes place from mid to late summer. 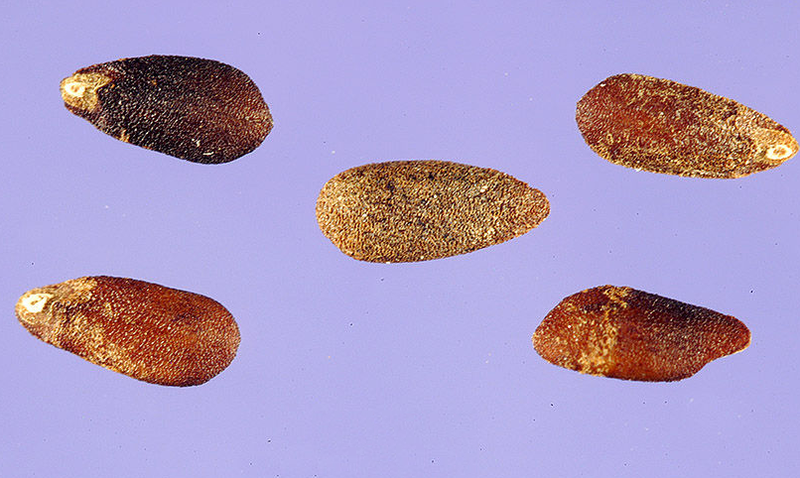 Fruit later develops in to small oblong achenes. Native to southern Europe and Eurasia, hyssop came to North America with the early European colonists; the herb is listed among the seeds John Win­throp, Jr., brought to the New World in 1631. Over the years, it has escaped from gardens and is now naturalized at roadsides and in waste places here and there in North America from Quebec to Montana south to North Carolina. 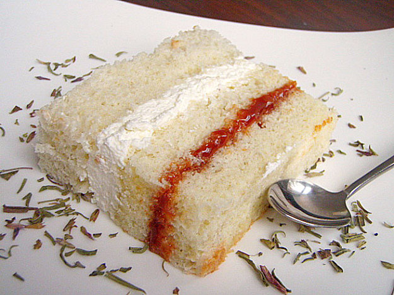 Now it is widely cultivated all over the world and often used as a decorative plant. Hyssop prevents infections from developing in wounds and cuts. Due to its antiseptic properties, when it’s applied to an opening of the skin, it fights infection and kills bacteria. It also helps in healing deep cuts, scars, insect bites and even can be one of the great home remedies for acne. Hyssop has antibiotic properties from the plant’s volatile oils. While the antibiotic properties are generally strong, they show the best results on shallow wounds and fungus infections. Hyssop is used in treating muscular rheumatism and bruises. It is said that when the herb is applied to wounds and skin cuts it helps in prompt healing. Ancient Greeks and Indians used poultices made using hyssop to treat bruises, scar, frostbite, conjunctivitis, insect bites, muscle pain and dental cavities. Leaves of the plant were used in cleansing rituals during the biblical times due to its anti-bacterial and anti-viral properties. Since Hyssop is anti-viral in nature and has the ability to expel toxins from the body that are gathered due to viral infections. Hyssop is used mainly to reduce fever, flu and cold infections. The herb helps to reduce fever by inducing sweating and therefore was traditionally mixed in bathing water. 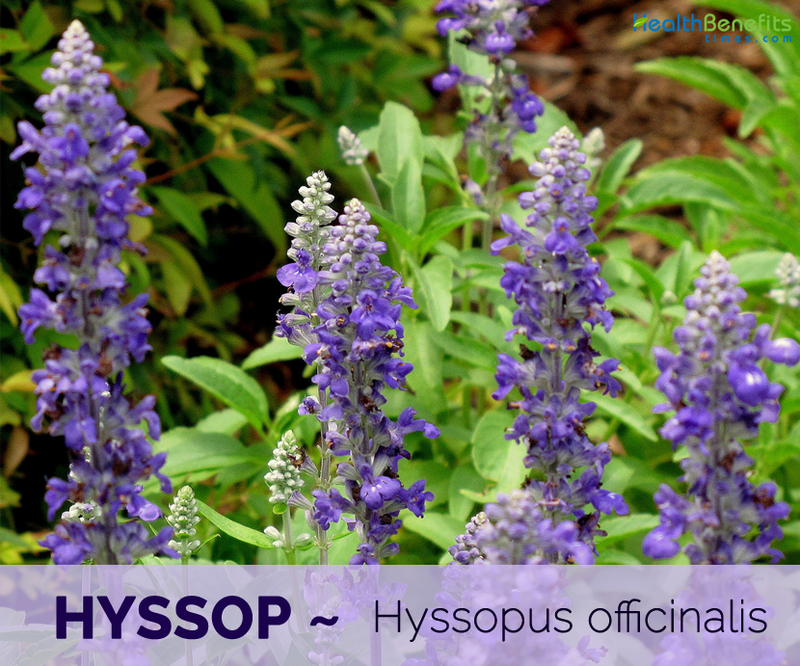 Hyssop is antispasmodic, meaning it relieves spasms in the respiratory system and calms coughs. It’s also an expectorant and helps to loosens phlegm that has been deposited in the respiratory tracts. This property helps heal infections from the common cold, and it helps treat respiratory conditions, such as serving as a bronchitis natural remedy. Coughing is a common reaction of the respiratory system trying to expel harmful microbes, dust or irritants, so hyssop’s antispasmodic and antiseptic properties make it a wonderful natural treatment for coughs and other respiratory conditions. Hyssop leaves are used in treating delicate stomach and in relieving some of the symptoms of indigestion such as gas, intestinal cramping, colic etc. Infusion made from Hyssop acts as an excellent tonic for the digestive system and helps in treating weak digestions. Many believe that the herb also helps in the functioning of the liver and gall bladder. Hyssop oil helps to diminish the look of scars and work as a natural treatment for acne, pox, boils, stretch marks or wounds. It also encourages cellular regeneration, and the growth of new skin makes old marks fade away. Since hyssop oil is antiseptic, it helps to kill bacteria on the skin and fight infections. Regular use of a few drops of this beneficial oil to your skin keeps you looking younger and healthier. Hyssop has the ability to fight parasites, which are organisms that feed off the nutrients of other organisms. Some examples of parasites include tapeworm, fleas, hookworms and flukes. Because it’s a vermifuge, hyssop oil expels parasitic works, particularly in the intestines. When a parasite lives in and feed on its host, it disturbs nutrient absorption and causes weakness and disease. If the parasite is living in the intestines, it disrupts the digestive and immune systems. Acid Reflux: Add 3-5 grans of dried herb in water. Prepare a tea. Drink once a day. Ascaris Make Infusion of the leaves of Hyssop. Have twice a day. Indigestion: Prepare a decoction of the leaves of hyssop. Take with honey twice a day. Skin Diseases: Make a fine paste of the roots and the bark of Hyssop. Apply over the affected area. Head Lice: Mix Tea tree oil and olive oil in 1:10 ratio. Apply it on your scalp and hair. Wash after 3 hours. Body Lice: Make a decoction of dried Hyssop. Use it while taking bath. Cough: Prepare a decoction of Hyssop, White horehound and Coltsfoot. Use it twice a day. Dyspnea: Take few leaves of lemon balm. Add Hyssop and Pennyroyal in equal quantity. Prepare a decoction. Have one cup once a day. Chest Congestion: Take a bowl of boiling water. Add 4-5 drops of each Aniseed oil, Eucalyptus oil, Fennel oil, Cardamom oil, Peppermint oil, Angelica oil, juniper oil and Hyssop oil. Inhale the aromatic smell. 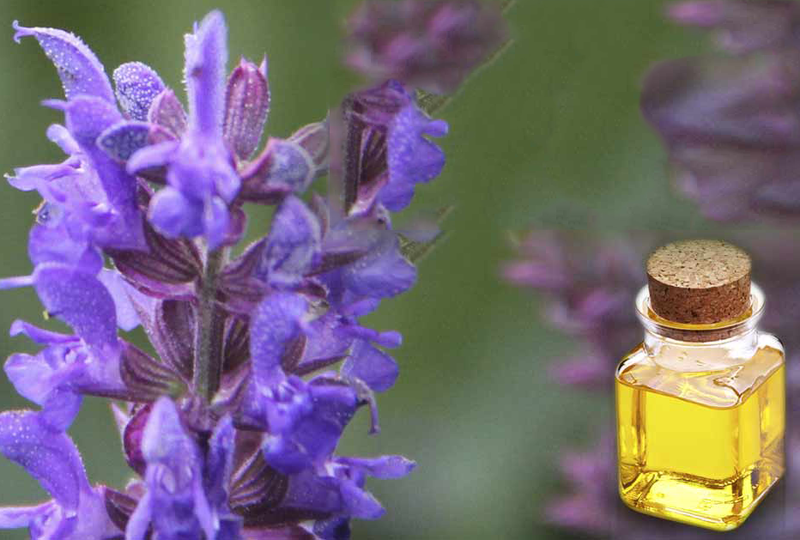 Treat skin irritations, burns, bruising and frostbite: Dilute 2–3 drops of hyssop with equal parts of a carrier oil (like coconut or jojoba oil) before applying to skin. Heal scars and wounds: Add 2–3 drops of hyssop oil with equal parts coconut or jojoba oil and apply the mixture to the specific area twice daily. Lower Body Temperature: Add 3–5 drops of hyssop oil to warm bath water to stimulate sweating and lower body temperature. Reduce fever: Massage two drops of hyssop oil and a teaspoon of coconut oil into your feet to reduce fever. Clear clogged respiratory system: Add 2–3 drops of hyssop oil to Vapor Rub to clear clogged respiratory system. Kill Bacteria: To kill bacteria in the mouth, gargle 1–2 drops of hyssop mixed with water. Increase Blood circulation: To increase blood circulation and repair damaged heart cells, add 1–2 drops of hyssop oil, or dried hyssop leaves to Heart Health Juice. 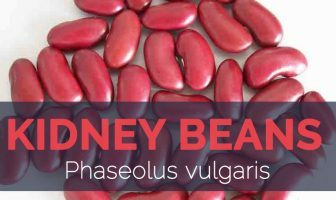 It is often used as a household remedy, particularly as an expectorant and stomach tonic. It has a positive effect when used to treat bronchitis and respiratory infections, especially where there is excessive mucous production. Tea made from the leaves is used in the treatment of flatulence, stomach-aches, upper respiratory tract infections, coughs in children etc. Poultice made from the fresh herb is used to heal wounds. Tea made with the fresh green tops, and drunk several times daily, is one of the old fashioned country remedies for rheumatism that is still used. 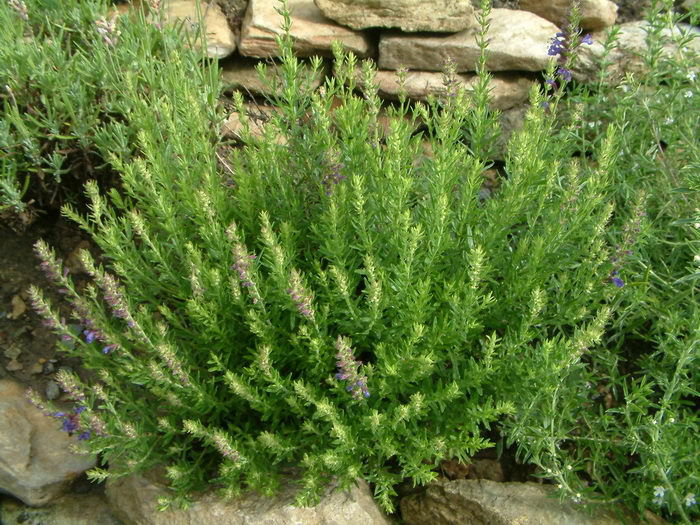 Hyssop baths is recommended as part of the cure, but the quantity used would need to be considerable. Hyssop can encourage the gastrointestinal system. Strong tea made of the leaves and sweetened with honey is a traditional remedy for nose, throat, and lung afflictions and is sometimes applied externally to bruises. Hyssop has been used in eye drops and mouth wash and is still valued for external use on cuts, bruises and muscular pains. Hyssop is considered as a stimulant, carminative and expectorant and is used in colds, coughs, and congestion and lung complaints. Flowers and leaves can be made into a tea to relieve stress and promote sleep. Tincture and tea of the flower used to cure jaundice and dropsy. Crushed leaves or poultice of ground leaves promotes healing of wounds and bruises. Hot vapors of its decoctions for inflammation of the ears. Decoction of flowers used as expectorant. It is used to treat chest congestion, coughs; used as mild sedative. It is used as gargle for sore throats. It is used as poultice for bruises, sprains, wounds and insect bites. In China, used to relieve colds and asthma. It regulates menstruation cycle in females, thereby serving as a potent emenagogue. It normalizes menstruation and alleviates pre-menstrual syndrome (PMS). It helps promote digestion by catalyzing the synthesis of digestive juices and enzymes. As such, it assists in the digestion of food and absorption and assimilation of nutrients. It also helps prevent various digestive ailments like constipation. Hyssop herb causes the blood vessels to contract, which, in turn, prevents sagging of the skin. Thus, the hyssop plant helps in preventing signs of aging such as fine lines and wrinkles; this can be attributed to its astringent like properties. It helps to tighten the gums and keep the mouth clean and hygienic. As such, it is vital for oral and dental health. Hyssop oil improves and enhances blood circulation. It helps prevents various infections including arthritis, rheumatism, and gout. Hyssop herb helps in clearing gas from the stomach and relieving diseases of stomach, including heaviness in stomach, stomachache, nausea, vomiting, loss of appetite, and indigestion. Hyssop herb can bring down fever, thus serving as a potent febrifuge. It helps fight infections and removes toxins from the body that are the major causes of fever. 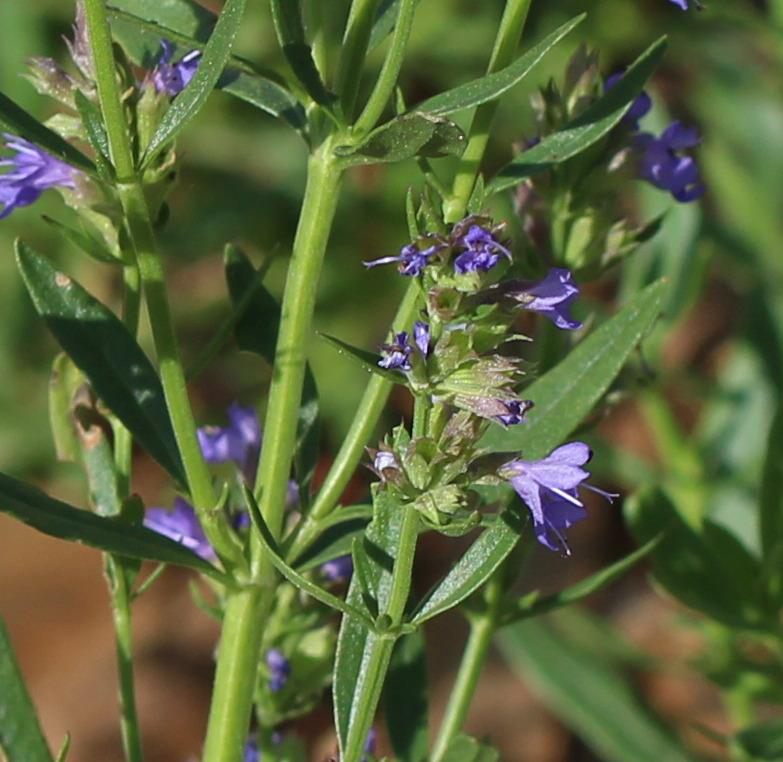 Hyssop oil promotes the healing of deep wounds. It also helps in removing scars and marks on skin, particularly caused by boils, insect bites, pox, and infections. Hyssop herb helps in clearing mucous and other deposits in the respiratory tract. As such, hyssop herb is a potent expectorant. Hyssop herb helps raise blood pressure. Hence, it is beneficial to those suffering from hypotension. It relieves the symptoms of low blood pressure, which are headache, nausea, and vomiting. Hyssop herb help to maintain the health of nervous system; it especially helps in cases of nervousness, convulsions, and vertigo. Hyssop herb oil promotes perspiration causing the secretion of sweat, which, in turn, helps remove toxins and excess water from the body. This helps improve skin tone and texture and also prevents the body from a variety of diseases. Hyssop herb helps to kills worms. It helps kill worms in the intestines, thus leading to absorption and assimilation of nutrients in the body. Moreover, it promotes normal growth and development in children by killing worms in their digestive system. 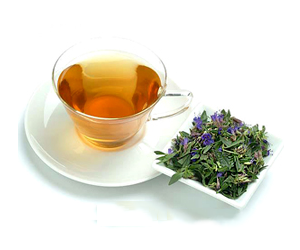 Hyssop tea is its ability to prevent and cure infectious diseases like cholera and diphtheria. 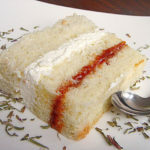 It also promotes quick healing of infections. Hyssop oil helps to cure skin diseases. It prevents and cures a variety of skin diseases including eczema, dermatitis, and psoriasis. It also moisturizes the skin, making it smooth and supple. Hyssop herb helps prevent diseases including cold, flu, cough, and fever. 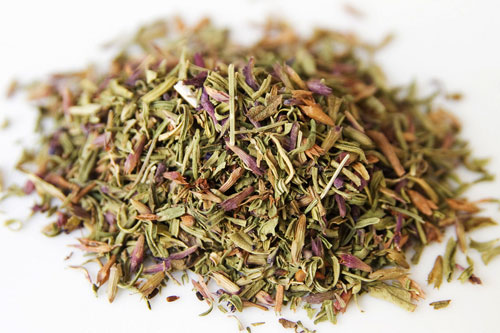 In order to cure a cold, hyssop herb can be used as an infusion. Hyssop helps in curing pains in the joints. It regulates the skeletal system of the body, thereby maintaining the level of synovial fluid. As such, it helps prevent diseases related to the joints and bones. 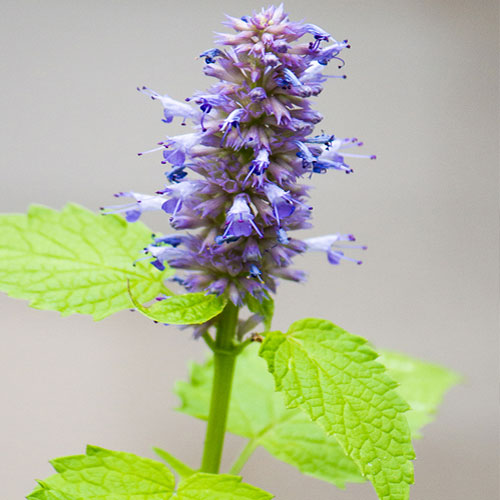 Hyssop herb helps to maintain emotional balance. It enhances the feeling of elation and alleviates anger, stress, and depression. It also helps relieve insomnia. Leaves and young shoot tips raw is used as a flavoring in soups, salads etc. It can be used fresh or dried. Raw flowers can be added to salads. An essential oil from the plant is used as food flavoring. Herb is also used to flavor liqueur and is part of the official formulation of Chartreuse. French liqueurs, Benedictine and Chartreuse, contain hyssop as one of the essential ingredients. Monks used hyssop to spice soups and stews in medieval times. Used in moderation one or two small fresh leaves, finely chopped, can add appeal to soups, stews, sauces and stuffing. Sweetly scented flowers can add flavor and color to green salads, or be used in pickles and preserves. Pinch of the herb is good in pea soup and in lentil and mushroom dishes. Sausages, pâtés, and meaty stews are often seasoned with this robust herb. 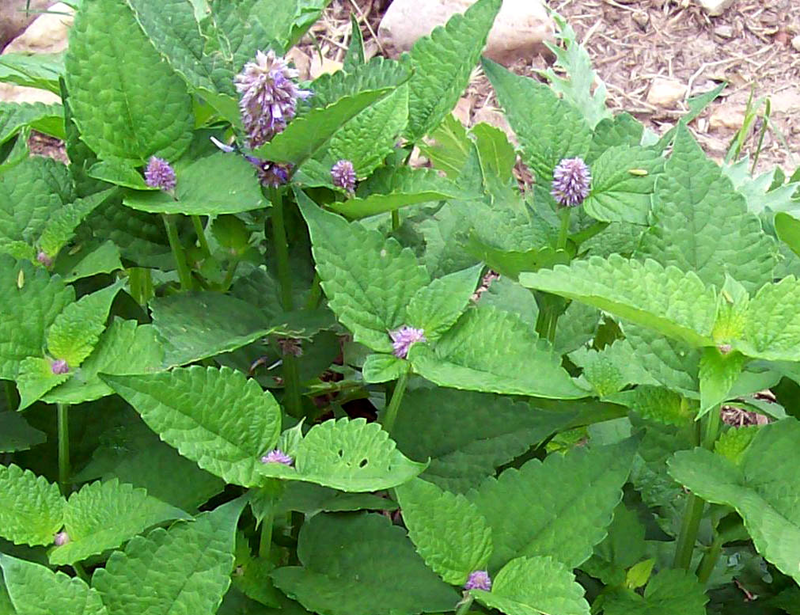 Little hyssop will anchor the flavor of a savory fruit sauce for duck, goose, or turkey. Hyssop is sometimes used in place of thyme to make za’atar in Israel. Essential oil is used in aromatherapy. An essential oil from the leaves is antiseptic and also used in perfumery and as a food flavoring. The plant was previously used as a strewing herb and is also used in pot-pourri. Tea made from the leaves is useful for controlling bacterial plant diseases. Plants can be grown for ground cover when spaced about 45cm apart each way. Plant is commonly used by beekeepers to produce a rich and aromatic honey. Plant is also used to make an essential oil, extract and capsule. Thought to ward off evil and misfortune by Ancient Greeks, it was used to cleanse homes and temples. Cooled hyssop tea is a refreshing and cleansing facial rinse. 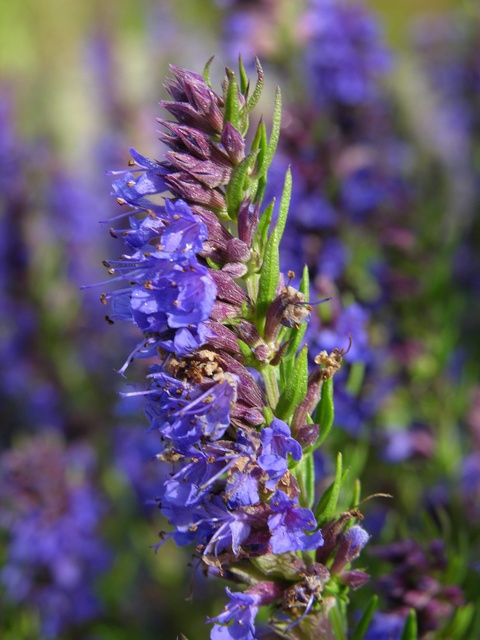 Hyssop was once hung in homes to protect from evil and witches. Volatile oil can cause convulsions. Avoid with epilepsy of fits. Plant should not be used by pregnant women, however, since in large quantities it can induce a miscarriage. This oil should not be used on people who are highly strung as it can cause epileptic symptoms. The essential oil should not be used internally except under professional supervision. Do not give hyssop to children; convulsions were reported in a child who took 2–3 drops of hyssop oil over several days. 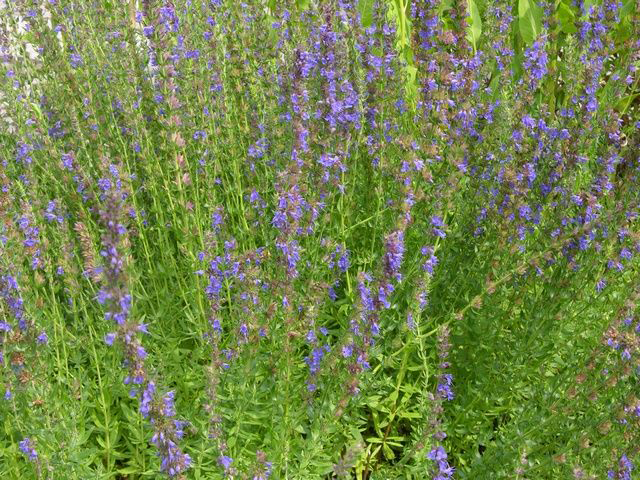 If you have a history of seizures, do not use hyssop because it may trigger seizures or make them worse. Hyssop is also known to increase blood pressure, which can be beneficial to people with low blood pressure, but problematic for people who are trying to lower their levels. 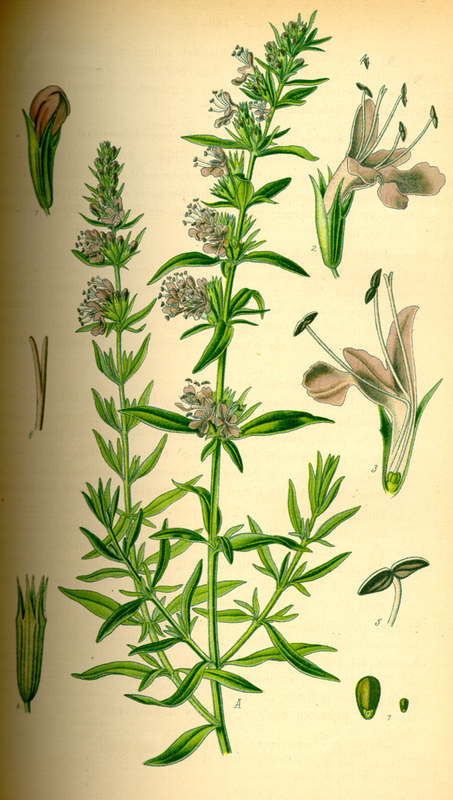 Hyssop can cause nausea, upset stomach, and diarrhea in susceptible persons. Symptoms of overdose include dizziness, tightness in the chest, and disturbances of the central nervous system. Soil Perform well in poor soils including dry, sandy ones, but generally prefer well-draining, fertile loams. Plant Size 2 -3 feet tall and has a spread of about 1 foot. Stem 20-50(-80) cm, much branched, striate, pubescent, quadrangular stems. Leaf Sessile, linear to lanceolate, 2 to 2.5 cm (0.79 to 0.98 in) long, glabrous, glandular, scabrous and finely strigose along margin, base attenuate to cuneate, margin slightly involute, apex obtuse. Flower Flowers in whorls, six- to fifteen-flowered with a tubular corolla, two-lipped, blue or violet in color, with bell-shaped calyxes. Depending on the species, the flowers range in color from white to purple, pink, blue, or bluish-purple. Hyssopus officinalis var. albus Alef. Hyssopus officinalis var. altissimus (Mill.) Alef. Hyssopus officinalis var. angustifolius (M.Bieb.) Benth. Hyssopus officinalis var. cyaneus Alef. Hyssopus officinalis var. decumbens (Jord. & Fourr.) Briq. Hyssopus officinalis var. decussata Pers. Hyssopus officinalis var. latifolius Fisch. ex Benth. Hyssopus officinalis var. ruber Alef.